A single ply bass front head with a 5" port hole for miking. This is a great head to combine with the EMAD Onyx batter bass head. 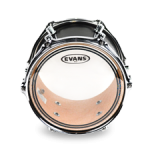 The 200 Snare side head is very thin and used often on wood snare drums. It is sensitive and works best in acoustic type situations. Tends to be very bright sounding. 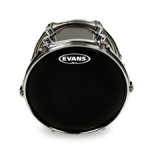 A medium weight snare head, the 300 is the most popular of Evans' snare side heads. Very articulate, it is a great all around bottom for any snare drum. 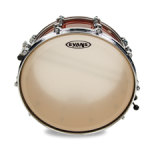 The EMAD Onyx is a thick single ply head with a dampening system which allows the player to adjust the attach and focus of the drum sound. It is black, has lots of punch and very good low end. 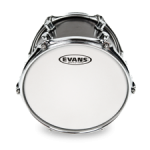 Because of the feel and sound of the Strata heads, many Concert snare drummers have found them to be adaptable for wide usage. They are extremely articulate and hold their tuning well. The "Staccato 700" version has been especially popular. 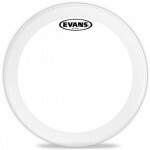 A clear double ply head with great attack, the EC2 has an edge control rim underlay. It is an easy tuning head with nice sustain and durability. An excellent tom tom head. A single ply head ideal for brush playing. It is primarily used for acoustic playing and very sensitive. 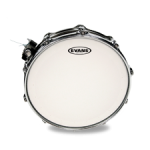 Single ply, the G1 Clear is a sensitive tom head for light to medium hitting. Easy to tune, the G1 has a "bright' open sound. A single ply coated head, very sensitive, the G1 Coated is a good all around choice. Good for brushes and open," bright" tuning. It also has a warm sound. It is a 10 mil thick batter head. A bottom tom head best combined with a double ply batter. The Genera Resonant gives a full, round, resonant effect. It has very good projection. A double ply head with depth and sustain. It has good attack and when tuned properly will have your toms "singing." A durable head. Popular with Rock and Pop players. A very thin bottom head with great sustain. 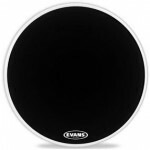 It is black and a bit thicker than the clear resonant head made by Evans. It makes an excellent combination with single ply batters. 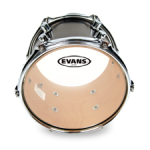 The thinnest of Evans' resonant bottom heads. The Reso Glass is excellent for providing sustain and projection on all toms. 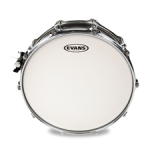 A double ply head with an underside inner ring, the EC Snare Battery reduces frequencies and thus enhances attack. 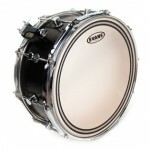 A thick single ply coated head.It has great projection and is a 12 mil construction that holds up to heavy hitting. The Genera Dry is a single ply head with a control ring on the underside. In addition, there are vents around the perimeter of the head which reduces sustain and overtone. The head is coated. 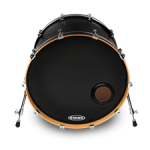 The Genera HD is a coated, double ply thick head with an underlay ring to mute high overtones. It has strong attack and holds up to heavy hitting. The Genera HD Dry is a thick, double ply head with an inner ring on the underside. In addition, there are vent holes around the perimeter to make the head drier than normal and create less ring. 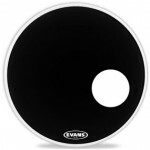 The clear Evans EMAD Bass Batter is a very popular dark, low pitched head. It is single ply with lots of punch. The external dampening system on the head is adjustable for attack and focus. Excellent Rock and R&B quality. A single ply black head with a 4" port for microphone input. The combination of the EMAD batter with the resonant is a very distinct, low end effect. 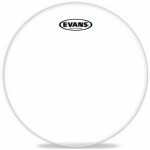 The EQ2 is double ply head with an internal ring for sound control. It is an articulate head and very good for heavy footwork. A thick 2 ply head with good low end attack. 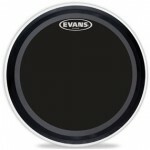 The EQ3 is very well focused and good for live playing situations. A single ply thick head, the EQ 4 has an internal control ring and a removable muffle ring. The dry vents around the perimeter give it a very focused, low end tone. 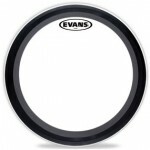 This is a popular front bass drum head. It is single ply with dry vents and an internal control ring to help with the low register.